I managed to finish the first panel on Lizard Ridge last week. 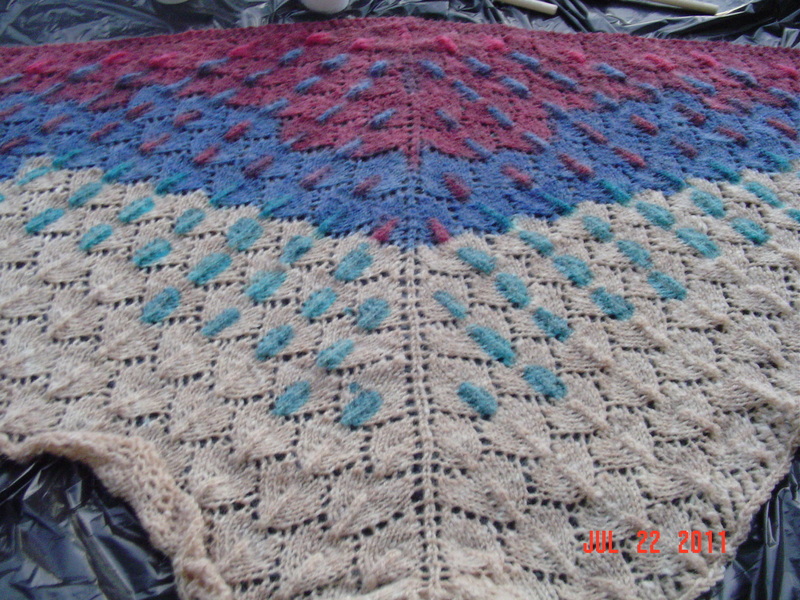 I am limiting myself to projects which are already on the needles due to less knitting time in general. Currently Lizard Ridge and my aran Starmore sweater are seeing the most action. This weekend will be full of cleaning Bug’s room, bike riding, and wandering through bike stores. It should be a lovely weekend! Indeed it does when you keep busy. 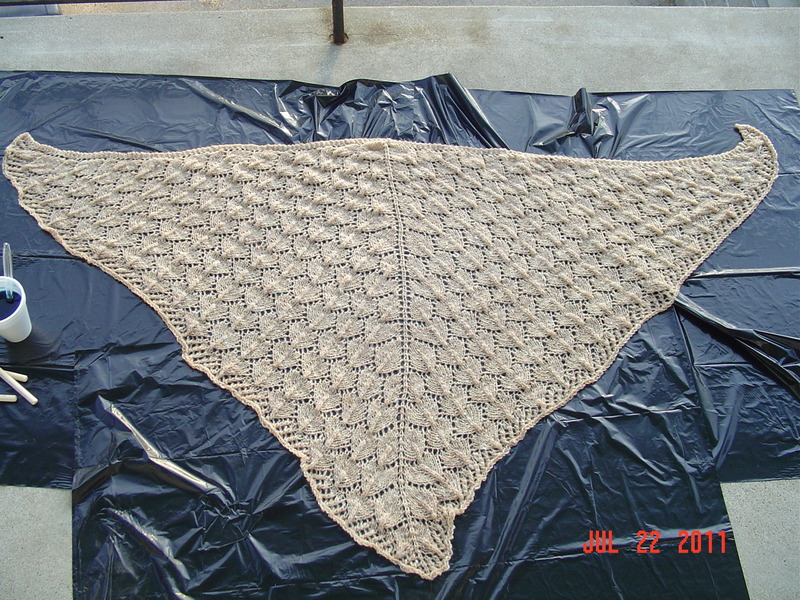 I started this little shawl before I even left for vacation, but have only just finished it even though it is a quick little knit. 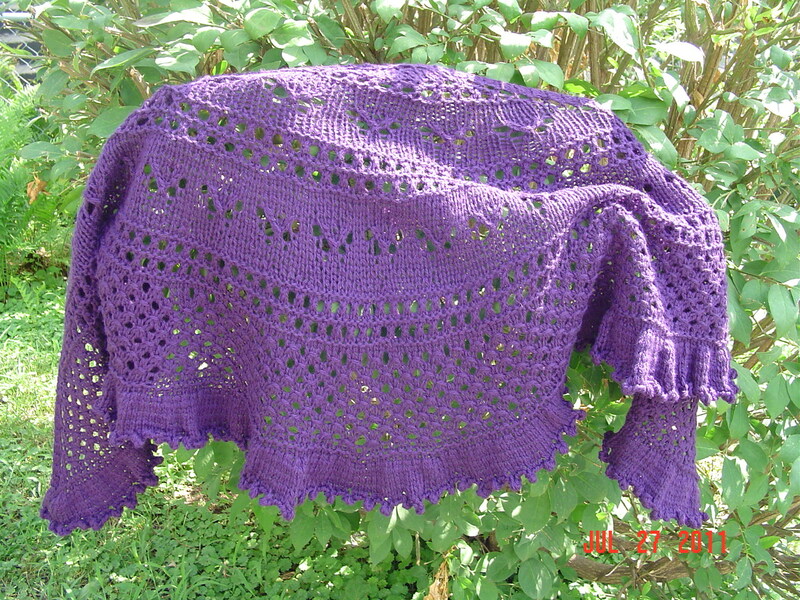 Using worsted weight yarn really helps speed up the process. 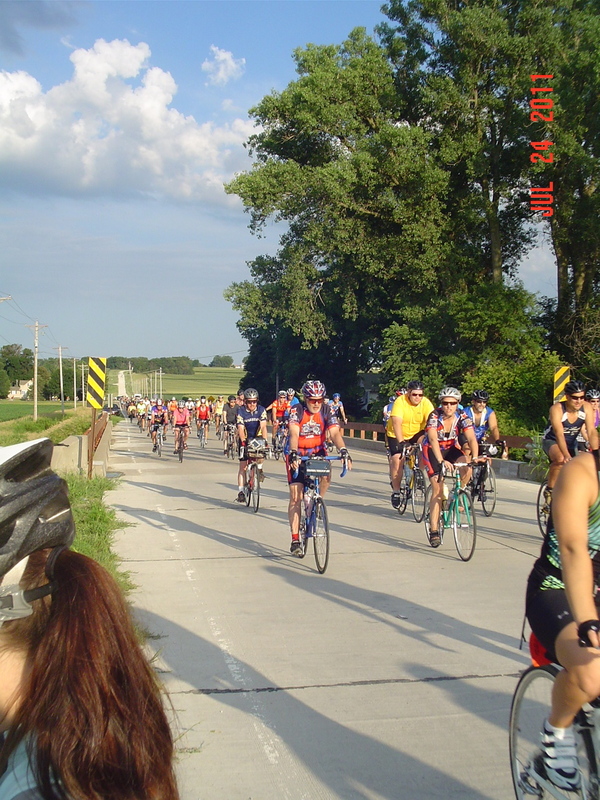 Biking has taken priority while I have the opportunity, I am sure the crafting will start again as the weather cools. 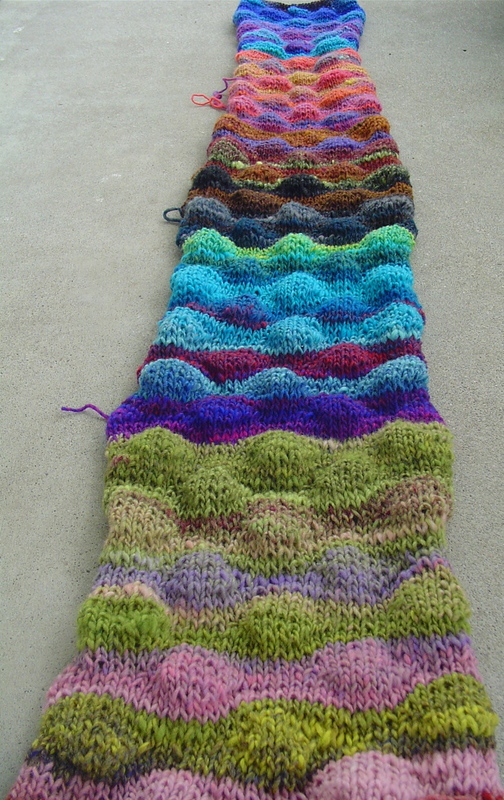 Yarn is knitpicks palette held double. But of a different sort. 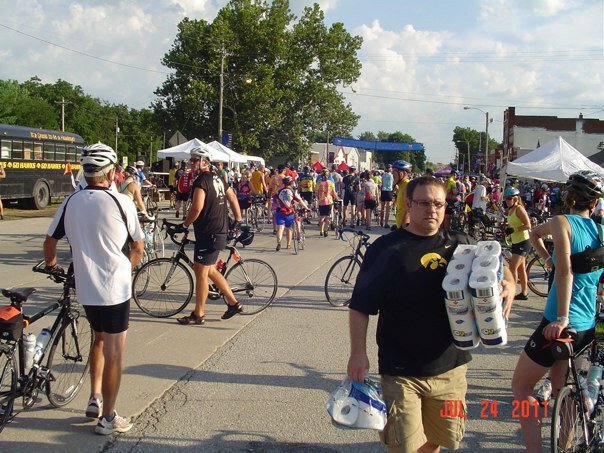 For two years I’ve wanted to ride the first day of RAGBRAI. This year I finally had the opportunity to do it. As you can see from the route map, it is all hills. I have a bike not made for this type of ride, but I wanted to do it anyhow. So I took my bike to a local shop, got it cleaned up and serviced, purchased stuff to make my own kit, and I headed off early Sunday morning. 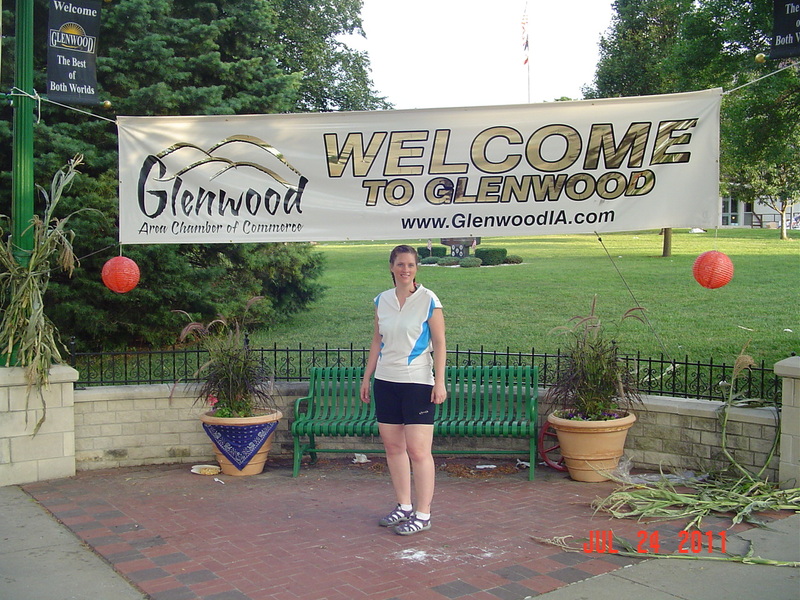 This is me in Glenwood, at the starting point. I met up with my friend Erin soon after this. We started out, and ended up stopping on the only flat part of the trip soon after to get a few pictures. 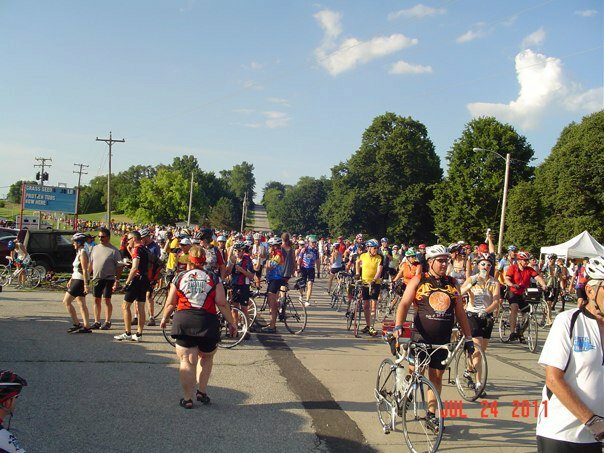 It is really difficult to capture just how crowded a ride with 10,000 registered cyclists along with all the taggers like me actually is. Our first stop was Silver City. In the first picture it is looking back over the hill we just came down (to the left) and the second picture is looking forward into Silver City. Carson was the technical halfway point for the ride. 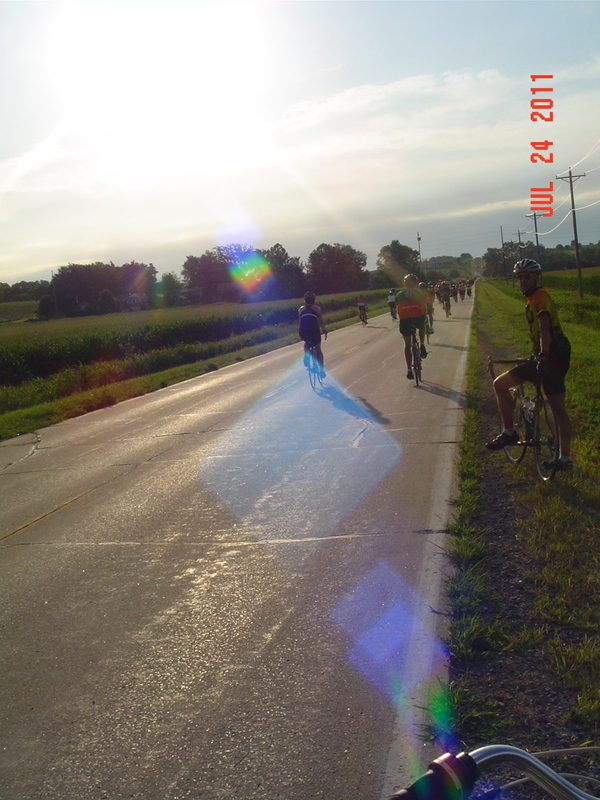 At that point, I could tell my bike was putting a lot of pressure on my back and I was very stiff and sore. 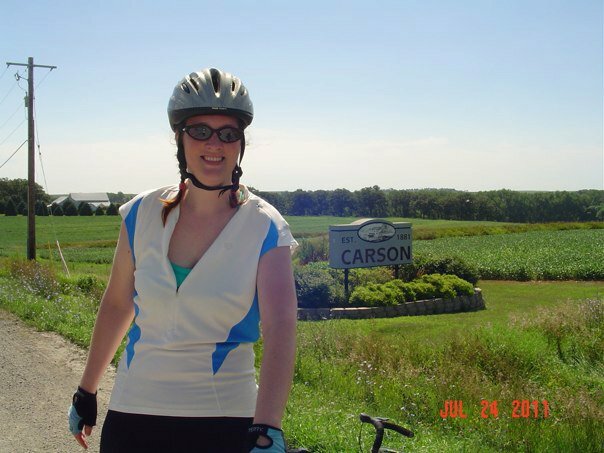 In the end, I made it 15 more miles past Carson, a total of 45 miles, and then I called my ride to come get me in Griswold. My back couldn’t take it, and I still feel insanely proud of myself for getting as far as I did. The last 15 miles was very hot and humid, hills under the direct sun, and my face is burned. My back is tender. My legs slightly tired but not at all sore. I actually feel a lot better than I anticipated feeling. As you may know, I’ve been talking about doing this for a good long while. Thankfully, I was able to complete the project over the weekend. 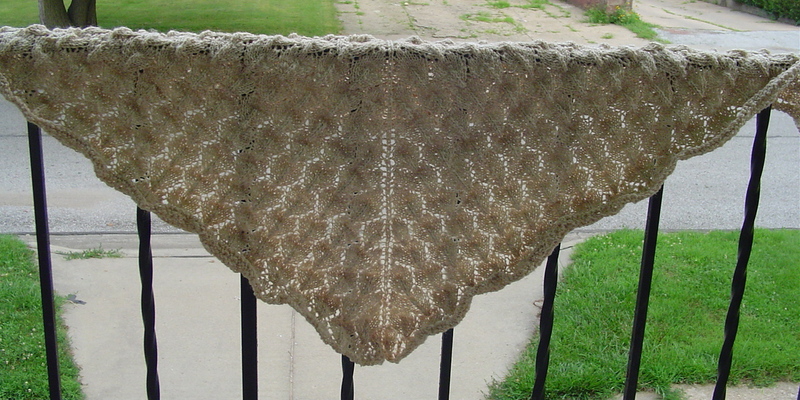 I knit my handspun shawl, which is a blend of alpaca, cormo, and silk. 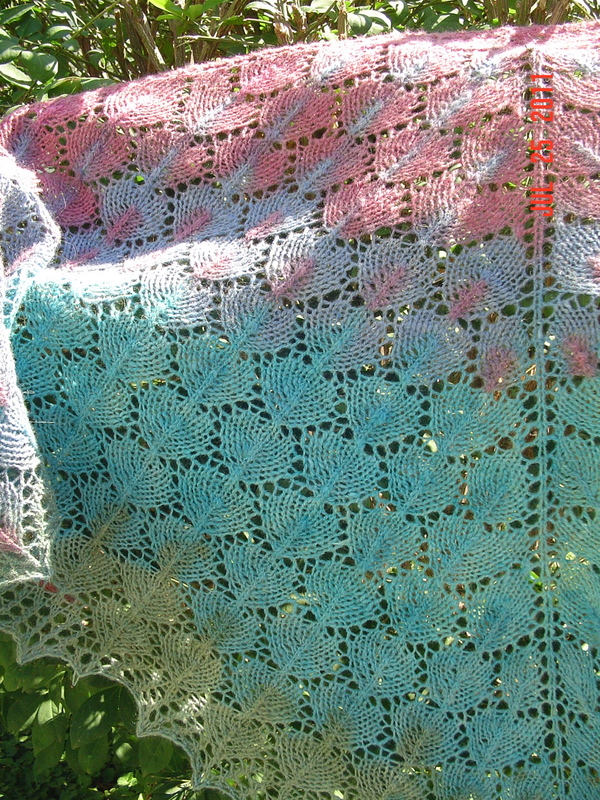 Pattern is Melusine. 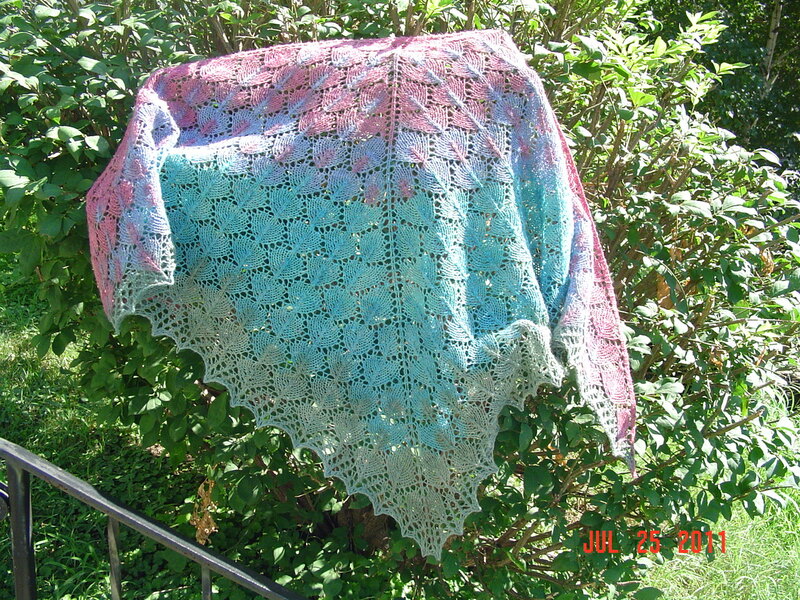 Once I finished my swatch dyeing project, I soaked my shawl. Then I put it out on three black plastic trash bags on my porch. 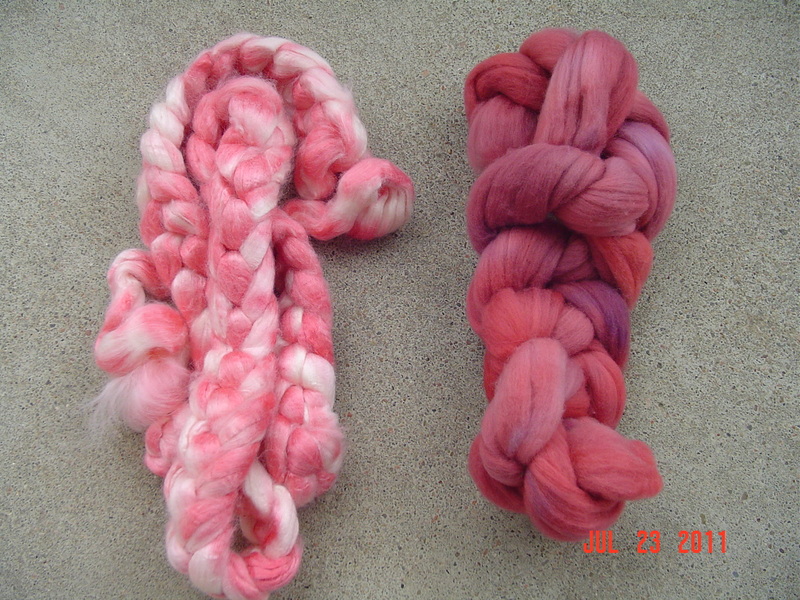 My dyes are landscape dyes, and I used sodium alginate as a thickener. I used small foam brushes to do the actual painting. 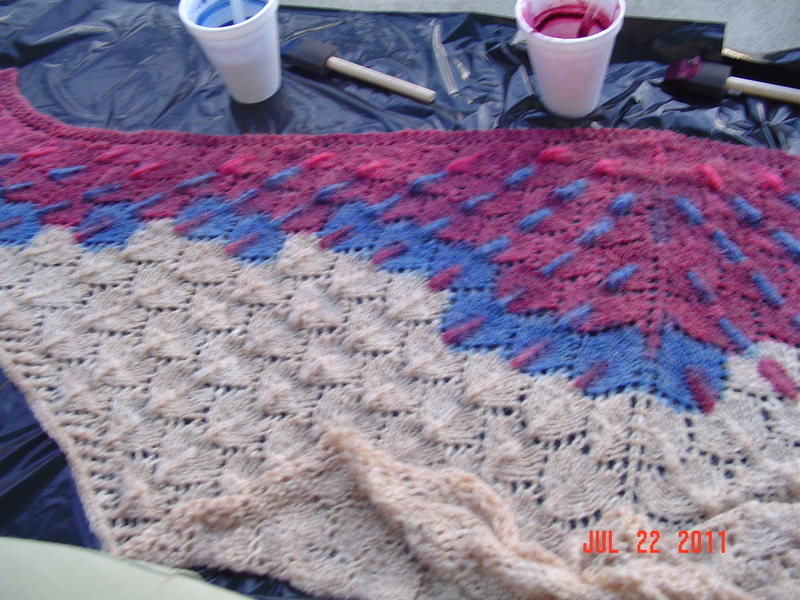 I took a few in progress photos, but after the last one, it was too dark to continue to use the camera. Additionally, I had no idea it would take hours to do this. It was a very time intensive project. It was also a great deal of fun. I am such a pattern follower that it was difficult to just think out of the box and do whatever I liked with the painting, but I am pleased with the result. Even more so, I am pleased I completed the project, since I was dreaming about it over and over and over. Once I was done, I wrapped up the black trash bags, added another over the top, and secured the entire thing with large rocks and porch furniture. 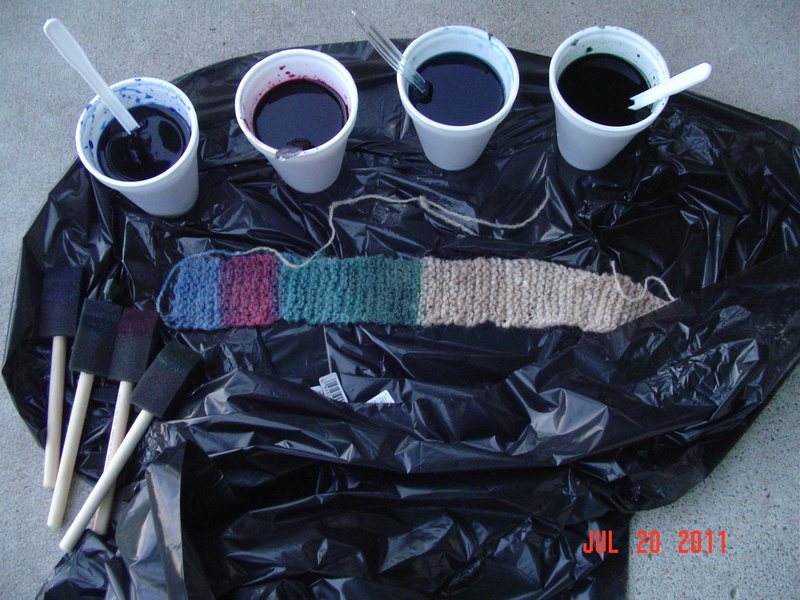 Once the day got hot, the trash bags also heated up, providing the heat necessary to solar dye the entire thing. I blocked on Saturday, and this is what I was left with. That is what the drum carder has allowed me to do. 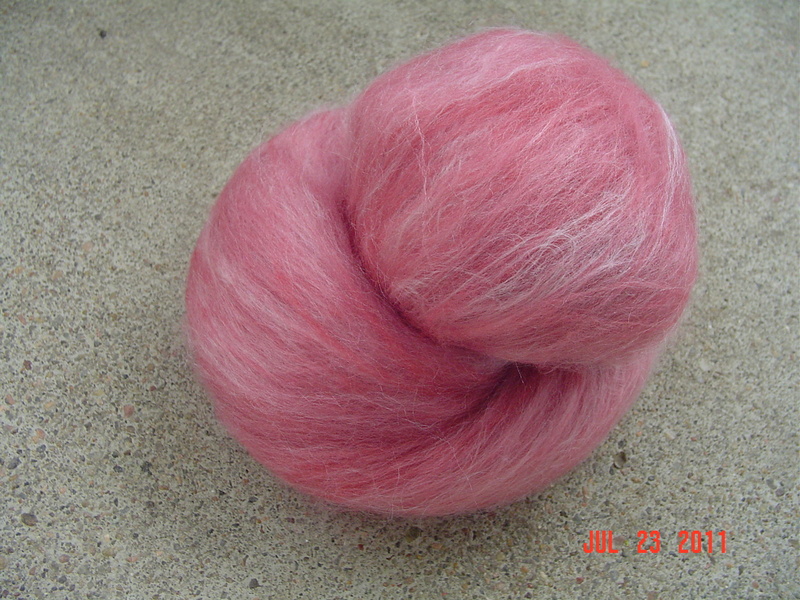 A gorgeous pinky mauve batt with high silk content and high sheen. Much much better! Of felting! 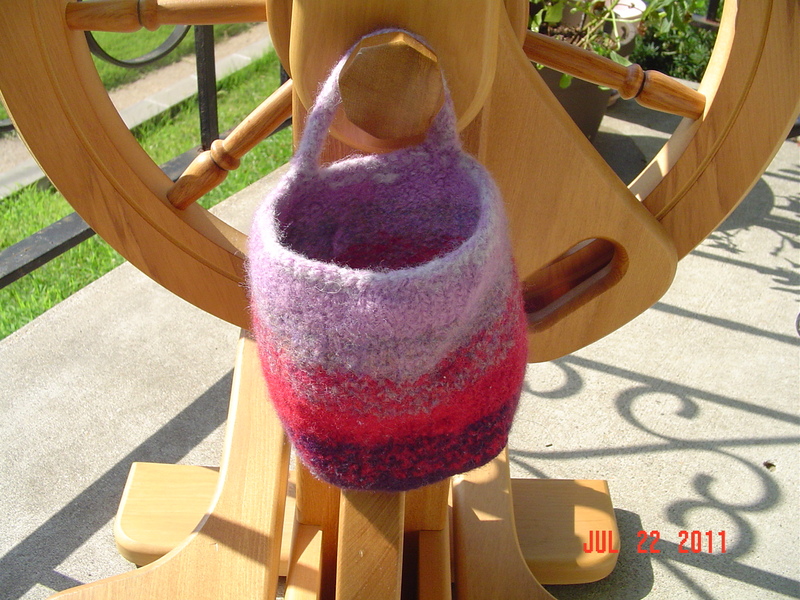 I made a tiny little felted wheel bag out of knitpicks palette I had left over from other projects. It holds my orifice hook, leader, WPI gauge, and a calculator at the moment. I love it! I may not be blogging overly much right now, but plans are being made, have no fear. 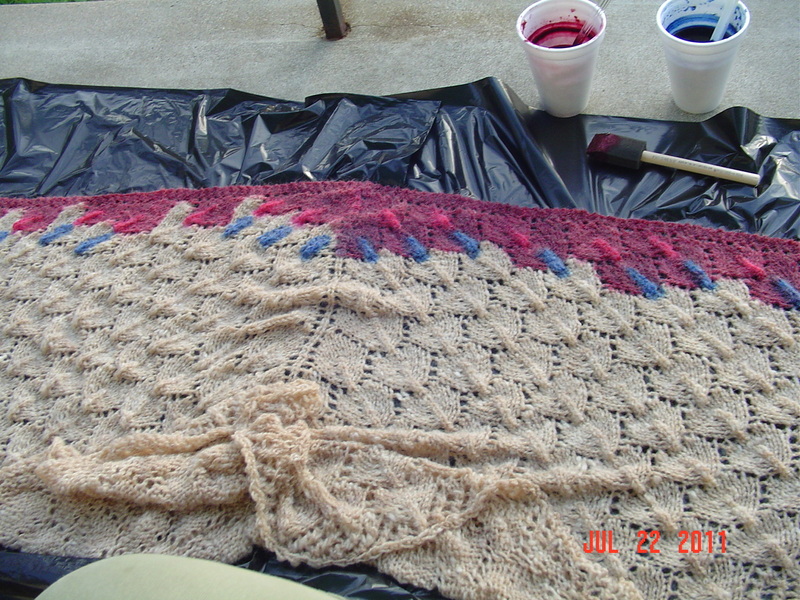 I’ve mentioned before that I’d like to hand paint a shawl, and I’ve now knit that shawl out of handspun. I did get some thickener and am all prepared to do the painting, but I thought I’d try a small swatch first. Initially to test the color on, and then additionally to see if my porch gets hot enough to set the dye if the item is in a black garbage bag. Oddly, for the first time in awhile now, it rained and is cooler. The bag tried to walk off the porch during the night. I’ve rescued it but I am not sure I’ll know until tomorrow morning if the dye will set properly this way. There are other plans, plans to work on long abandoned projects rather than casting on new projects. Those seem like very good plans. Plans that make sense for my project page. I am eager to work on those plans.